On Thursday 6th September Whale held its annual charity BBQ at their factory in Bangor. 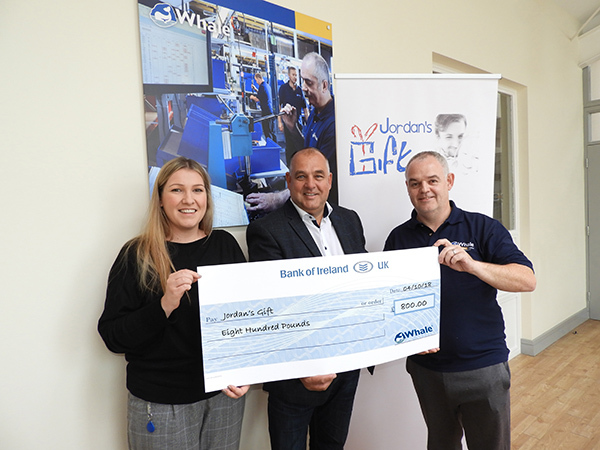 Each year employees are asked to suggest local charities to benefit from the proceeds of the event and this year’s nominated charity was Jordan’s Gift. A Northern Ireland charity set up to remember Jordan Kennedy who died suddenly, the main purpose of Jordan’s Gift is to honour Jordan’s memory by raising funds to assist young people who are disadvantaged by way of disability or need. A total of £800 was raised for the charity by Whale employees during the BBQ which included a charity raffle with many great prizes including vouchers for local restaurants and much more.